It’s guest post week here at Baby Cheapskate! Today’s guest post is from Tiffany, who blogs at SimplyModernMom.com (Thanks, Tiffany!). Once my oldest daughter, Kaye, turned 2, she showed signs of readiness of potty training, but took no interest in it. I wanted to get her out of diapers before the new baby came, so I went with it. It wasn’t too bad. She was fully potty trained in about 2 weeks. Potty training has been the hardest thing I’ve done as a mother thus far. It has really tested my patience and my ability to stay calm during difficult situations. It has brought many embarrassing moments and many moments where I wondered, Why am I doing this? Diapers are easier to change than cleaning up after poop and pee in carpet. Remember that each child is different. What worked with your friend’s child may not work with yours. What worked with your first child may not work with the second or third. Read Up. Toilet Training in Less Than A Day answered all my questions. It told me exactly how my child was going to react to potty training and the different tactics they will use when faced with this situation. Clear your calendar. Potty training is one of those moments where you need to give your child uninterrupted attention. Be prepared to devote at least one whole day without distractions to it. Forget about your emails. Ask someone to watch your older kids, if necessary. Once they get the hang of it and know what is going on, then get back into regular routine. And don’t travel. 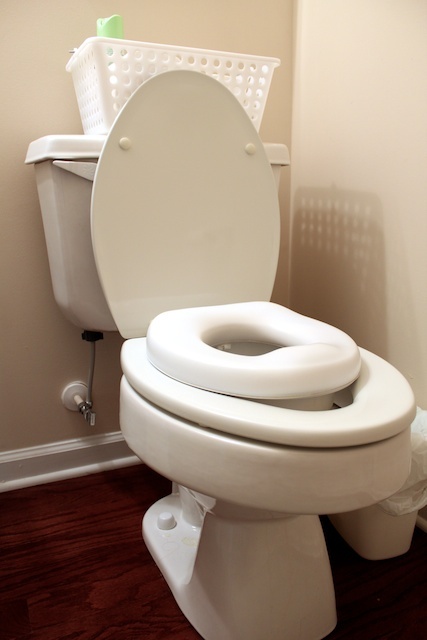 If you are traveling or moving shortly before or during potty training, you are sabotaging yourself and your child. Stay at home and potty train. Be consistent. At this age, they are testing you. They want to know if you are in on this. If you convince them you are, then they’ll get with the program. To do that, you have to be consistent. Show them that this is not just something temporary or something that you will give up if it doesn’t work the first few days or even weeks. If you give up, they will too. Balance reminders with trust. In the beginning, you will remind them constantly to go potty, and sometimes take them to the potty even if they don’t need to go. As they start to get a hang out it, make the reminders less frequent. Throw a party. Get them excited about it. I threw a pink princess potty party it on the first day to introduce Kaye to potty training. I decorated the living room with little underwear and had lots of pink drinks around (juice, strawberry PediaSure or strawberry milk). Her grandma bought her a potty doll. We had a collection of children potty books. Potty Train Your Child in Just One Day is a book with themes, ideas and activities for potty parties. Don’t yell. This will be a hard one, especially when you are dealing the 5th or 6th accident of the day and you are at wits end. But if you yell, they will resist or feel being punished. Make them accountable. When they have an accident, have them clean up what they can. Have them undress themselves and put away the dirty clothes. Have them put on new clothes with some assistance if necessary. If they are accountable for their mess each time they make one, they won’t want to make messes anymore. Be prepared to sit there with them for a long time. They will sit on the toilet and tell you they don’t need to go, but as soon as you let them off, they hide in a corner and let it go. Next time you see them holding it, put them on the potty and sit there with them. I sat on the floor while Kaye was on the potty. We sang songs, I told her stories, we read books, she flipped through children magazines or catalogs. Find their motivator. What motivates your child? Positive attitude, support and encouragement? Or nagging, threats and punishments? Motivation can come from outside sources, too. Maybe they have always wanted to go to Built-A-Bear and make a doll. Make it come alive. When Kaye reverted after the new baby was born, we purchased a set of little Disney Princess figurines. If she went a few days without an accident, a princess would show up on her pillow before bedtime with a personal note praising her for her success. And once in a while brought up some pointers for things she needed to work on. It was better coming from a “princess” than mom. Rewards can come in many forms. There are instant rewards and long term rewards. Make the instant rewards small. Candy, stickers, a small toy and lots of praise. Make the long term reward a little more meaningful. A trip to the museum, a sleepover at grandma’s house, a bigger toy or something else they really would like. Celebrate with others. When they are successful, make them feel proud of their success. Call dad at work. Call grandma in another state. Have them tell of their achievements. Watch Potty Power. It’ a cheesy movie, but kids love it. I used this as a reward sometimes because Kaye enjoyed the movie so much. They are smarter than you think. Haven’t we heard this before? Unless you are potty training at one year old or your child has special circumstances or disabilities, they should be able to grasp the concept. Drop everything and go. That will be one of the hardest concepts for the child to comprehend. They are used to going while playing. Now they have to stop what they are doing to go? No way! Show them that the quicker they go, the sooner they can get back to playing. Public bathrooms may frighten them. Kaye didn’t like all the noise of public bathrooms, the size of everything, the loud flushing and the fans and hand dryers. I would bring her into a stall, allow her to get acquainted to this new environment and wait until she was ready. There were times she would try to convince me she didn’t need to go, so I had special rewards or treats in the diaper bag for such occasions. Put extra clothes in the car. Keep an extra set of clothing in the car in addition to the one in your purse or diaper bag. Sometimes they might go through both sets in one trip. Or you might forget that you used the set in the diaper bag last time and forgot to refill it. Tiffany, a mom of two, blogs at Simply Modern Mom. It’s a site dedicated to simplifying lives of modern moms with lots of tips, lists and simple photo tutorials.